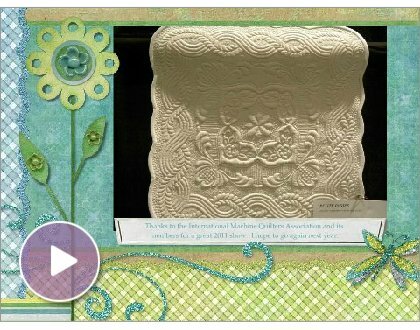 The Quilt Show has a wonderful Smilebox presentation of some of the quilts from the Machine Quilters’ Showcase in Overland Park, Kansas. The show was May 11 – 14, 2011. As you will see in the detail slides – the workmanship is fantastic! I was fortunate to have been the appraiser at the show. There is a quilt exhibit as well as workshops at the weekend event. Photo is the Quilters Hall of Fame’s. Kaleidoscope Quilts: The Art of Paula Nadelstern, organized by the American Folk Art Museum , will be shown at the Akron Art Museum in Akron, Ohio, from June 18 – October 2, 2011. If you didn’t have a chance to see the exhibit at the American Folk Art Museum in New York City, hopefully you’ll be able to see it in Akron. Here are more winners from the AQS Paducah Show in April.